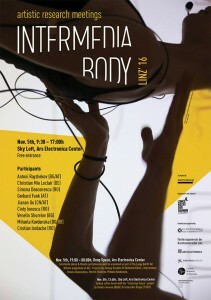 The symposium “INTERMEDIA BODY: artistic research meetings” will gather artists from different fields, working in the multi-faceted realm of Intermedia Performing Arts. Austrian and international artists will present their projects & research, share working experience and take part in pannel discussions. Participants: Antoni Rayzhekov (AT/BG), Christian Mio Loclair (DE), Mihaela Kavdanska (RO/BG/AT), Gerhard Funk (AT), Jianan Qu (CN,AT), Simona Deaconescu (RO), Venelin Shurelov (BG), Cinty Ionescu (RO), Cristian Iordache (RO). The project is initiated and curated by Mihaela Kavdanska/ AVmotional Platform and realised with the support of Rumänisches Kulturinstitut Wien, Förderungsverein der Kunstuniversität Linz, Interface Cultures Lab, National Centre for Contemporary Dance Bucharest & International Graduates Club Linz.